Welcome to the worlds greatest guide to Women's Shoes. Are you actually looking for Women's Shoes? Well, we hope you are because the reality is that you have found our Women's Shoes page. Women's shoes are more than simply foot coverings. Yes, the typical definition of a shoe is a covering of the foot. However, many women wear them for the fashion rather than simply for utilitarian pursposes. A ladies shoe is a covering for the foot that is typically made of leather and have a sturdy sole. They generally do not reach above the ankle. Although leather is a popular choice, shoes obviously can be made of other materials as well. A shoe is a type of footwear that is for the most part intended to protect and comfort the foot while the wearer is doing various activities. Again, they may be intended for protection & comfort but that is not always the case. Some women's shoes are actually very uncomfortable and offer little protection. From comfortable flats to designer heels, footwear retailers have the shoes many women need and want for every occasion. Whether you’re searching for classic black pumps, new running shoes, or over-the-knee boots, it’s easy to shop at online retailers such as Amazon or at your locate shoe store. Don't forget to check out the women's footwear page. Traditionally, shoes have been made from leather, wood or canvas, but they are increasingly made from rubber, plastics, and other petrochemical-derived materials. Ladies shoes can be dressy, casual, extremely formal or anything in between. 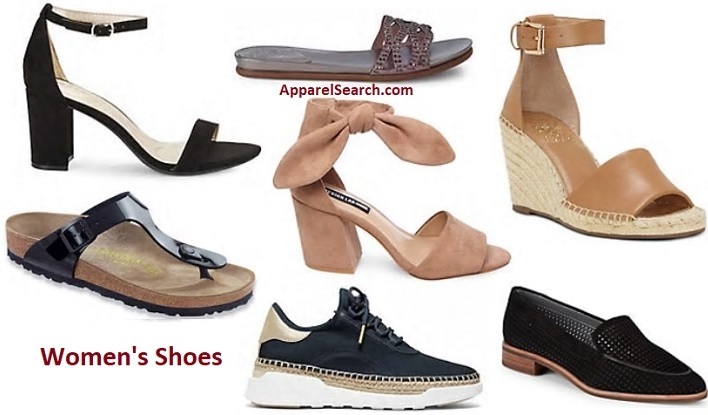 Consumers can find a very wide assortment of women's shoe styles, colors, and sizes. Platform shoe: shoe with very thick soles and heels. Above are a few of the women's shoe options. Learn more about various types of shoes. Apparel Search is a leading guide to fashion, style, clothing, glam and all things relevant to apparel. We hope that you find this Women's Shoes page to be helpful. If you want to be even more stylish, you should wear your favorite favorite pair of shoes.